Cover art by Kimberly Steele. Buy in print or e-book download here. Also available on Amazon. A little nine-year-old girl named Tojet appears at a Catholic school, where an orphan named Merkit Terjit teaches fourth grade with Sister Elizabeth. 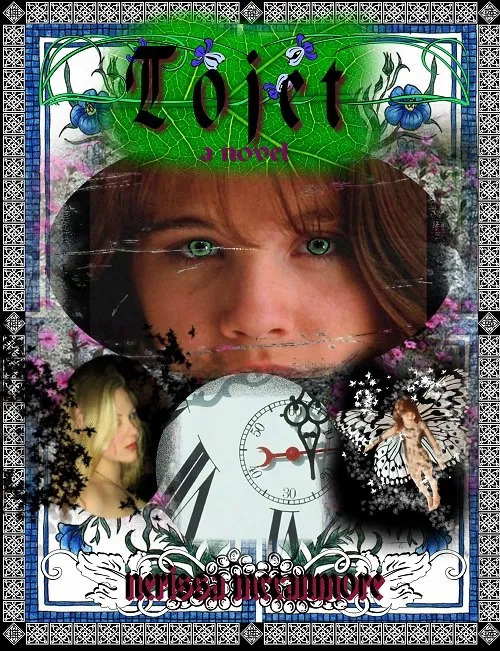 Tojet is an imaginative little orphan herself that talks of living with fairies, traveling through time and about how she and Merkit are betrothed. A few months later, tragedy happens, and Tojet disappears for three years, only to reappear as a beautiful eighteen-year-old maiden to a very bereaved Merkit, who has decided to become a monk, and is about to end his time as a novice and take his first vows to actually become a monk. Now, he must choose either Tojet or the monastic vows he is about to take. Throughout the book, Tojet takes Merkit on dream-visions (a power taught to her by pixies) where he experiences a world that most of us only dream about: fairy hills, exotic creatures, and European life in the 6th century. He experiences feelings and desires that we can only imagine; lusts that we can barely comprehend. He is abducted by a mermaid, entranced by a fairy queen and is disgusted by goblins. When she returns to him as a maiden, hoping he will accept her as a bride, her dream-visions become more sexually explicit. McCanmore deserves props for her attention to detail; not only her definitive descriptions of dress and surroundings, but also to historical detail, citing the evolution of language and time measurement. Throughout the book, I felt as though I was being pulled into one of Tojet’s dream visions. Every time I opened it, I felt as though I was instantly transported to another realm, and when I was forced to close it, the current scene I was in lingered in my mind, making me feel almost as though in limbo between her world and the real world. The only part about this book that isn’t in every way perfect is the end. I felt as though almost robbed of the climax by too much happening within the last couple pages. That aside, Tojet is a wonderful piece of work; a perfect introduction of an author into the fantasy genre. I give it a big 3 thumbs up. fairies and pixies and all things fantastic . . .
Tojet was based on a dream I had in 1996. The dream itself was caused by a story in Science Fiction and Fantasy magazine, in which Alice Liddell (of Alice in Wonderland) was a child vampire trying to tempt Lewis Carroll. My dream took on a life of its own after I wrote it down and began plotting out a story.